We stock everything you need for your lawn and gardens. 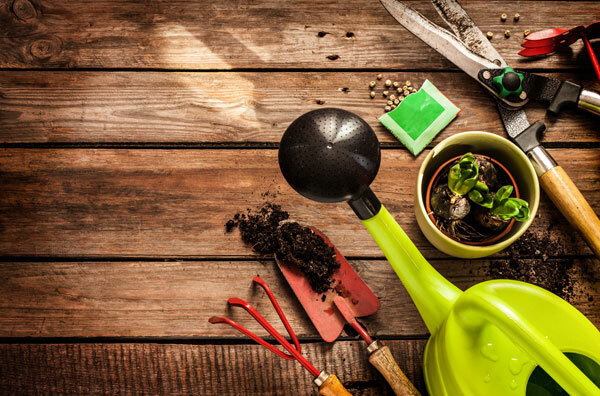 We have a large assortment of tools, live plants, plant care products, plus we carry many brands including Scotts, Black Gold, Miracle Gro, Jobes, Espoma , Ortho, and local products by Fox Farms. We have a large selection to choose from and many organic product lines too. Proper seasonal feeding of your lawn is a great way to keep the grass luscious and green. In this tutorial, Ashton Ritchie explains the proper schedule for seasonal lawn care and shows how to apply turf builder in a safe and effective manner. Sometimes sections of your lawn may die out. This can be caused by heavy foot traffic, disease, or a variety of other reasons. When this occurs, you may need to patch your lawn by planting with a matching lawn seed. In this tutorial, Ashton Ritchie explains the proper season, and how to properly patch your lawn and care for the new seeds. If your lawn is looking thin, unhealthy, or has bare patches, use these tips to help it become thick and healthy. This short tutorial covers patching your lawn, overseeding, and fertilizing. Whether you are seeding your lawn, fertilizing, adding soil amendments or pesticides, you’ll need to choose the right tool to spread your product. In this video we explain the benefits and uses of hand-held spreaders, drop spreaders, broadcast spreaders, hose sprayers, and pressurized tank sprayers. If your lawn has weed problems, there are a variety of solutions that you can use. In this short video we discuss pre-emergent herbacides, post emergent herbicides and two different forms of spot treatments. Sometimes you need to kill all vegetation in an area or have to deal with difficult plant infestations like blackberries or poison ivy. In these cases you may need to use a non-selective herbicide or choose an herbicide that is specifically formulated for the type of vegetation. There are a variety of effective methods to control landscape weeds. In this tutorial we discuss mulch, weed preventers and spot treatments. For an extra layer of protection consider laying down landscape fabric beneath your mulch layer. Ace sells a variety of products to help you control insects inside and outside of your home. In this quick tutorial learn how to apply pesticides to your lawn and landscaped areas, how to create a barrier to stop insects from entering your house, and how to deal with infestations using traps, bait, or sprays. Ashton Ritchie shows us how to maintain soil in a raised bed environment. In this short video, he harvests a crop of tomatoes, removes the old plant, and prepares the ground for a new planting. In today’s world, limited space is no excuse for not having a garden. In this tutorial, Ashton Ritchie shows us how to create a decorative container garden using a variety of grasses and plants and the right potting mix. This short video shows the basic components of an irrigation system, including backflow protector valves, sprinkler system valves, and the irrigation controller. This video tutorial explains how to splice into the main waterline that runs into your house, add a shut-off valve for a sprinkler system and how to layout and build a lateral system of supply lines for your irrigation system. It also explains how to run wire from your control system to your valve manifold. Learn about PSI, water flow, valve zone uses and other important concepts to explore before designing or building your irrigation system. Learn how to properly connect your control system into your valve manifold, how to install your sprinklers, and the other steps that you will need to complete to finish your irrigation system installation. The right sprinkler type for your irrigation system depends on a wide variety of factors, including water pressure and required shape and size of the coverage area. This video explains some of the main sprinkler heads available on the market today along with their primary advantages and disadvantages. Spot watering is an effective way to water a large number of individual plants without wasting water on large aerial coverage. With a spot watering system, you can bring water exactly to the plants that need it, and regulate how much water flows into each area. This step-by-step tutorial teaches you how to easily install a spot watering system in your own garden without needing to bring in a professional. Save money and the environment by converting sprinkler heads in your landscaping into low pressure drip irrigation systems. This short tutorial will tell you how to make the conversion. Drip irrigation systems by Toro are easy for the homeowner to set up. Follow the color coded instructions in this three step video to learn how to save money and the environment by installing a drip irrigation system in your yard. Container gardens can be labor intensive when it comes to watering. This short tutorial will explain how to install a drip irrigation system for your container garden, saving you time and labor. Keeping your chainsaw well maintained doesn’t just make it more efficient, it’s also a requirement for safe operation. All types of chain require frequent adjustments. In this short tutorial, we’ll show you how to adjust the tension for maximum performance. Chainsaws come in a variety of engine sizes, bar lengths and handle orientations. It’s important to select the right tool for the job that you are hoping to accomplish. Watch this short tutorial to learn which saw is right for your purposes. A chainsaw is a valuable tool to have around the house, but can be dangerous if not handled properly. Sturdy hard-toed boots, leg chaps, gloves, and a safety helmet can help to reduce the risk of injury. This tutorial covers the basics in how to use a gas-powered chainsaw, including sections on safety gear, safety features, proper starting techniques, proper stance and cutting techniques, and routine chainsaw maintenance. This informational video put out by Echo Incorporated helps you to determine what kind of backpack blower will best suit your needs. This tutorial walks you through how to use a gas hedge trimmer, including how to start the trimmer, proper safety tips, equipment operation, long-term maintenance and storage. This tutorial walks you through the steps of how to use a gas string trimmer, including proper safety gear, clearing the area of obstacles, and proper stance and movement. All two-stroke power equipment requires a fuel mix of gasoline and oil. A one gallon container of high octane fuel requires 2.6 fluid ounces of oil. Do not mix more fuel than you intend to use within a 30 day period, and since mixed fuel separates, remember to shake the container periodically. This 23 minute video from Husqvarna walks you through the basics of using your chainsaw, including proper technique and performance tips.